Attached is a photo of our German Shepherd, Toby. Toby is 3 years old and spoiled rotten! You will often find him sleeping on the couch or in our bed. He loves attention, which usually involves sitting on your lap and will not leave you alone until he gets his fill. 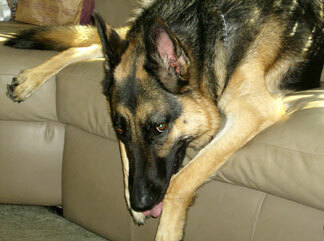 As most all German Sheperds, he is a very smart dog - too smart for his own good most times. If we don't lock the doors while he is outside, he knows to jump on the handle and push it open to let himself back in. He loves to play with squeaky toys, play with the hose in the summer and loves to go for walks. I take a water bottle for him when we go for walks, and when he wants a drink, he'll nudge my hand and look at the water bottle. Thank you for meeting Toby. Are you sure he;s spoiled rotten? :) I don't know - hard to tell that he has such a hard life while he's all sprawled out just laying around on your sofa! Boy, tough life, huh?! But he is absolutely gorgeous. And it sounds as though he has you all well trained too. I know the feeling. My German Shepherd frequently uses his powers of persuasion over me by using his "doggie mind meld" on me. He looks so much like my own! Hi, my GSD's name is Culloden, and he looks a lot like your Toby. Aren't they just wonderful? Cullie is now 2 years and 8 months old - we had him since he was 7 weeks. He's my best friend. I'd not say he is spoilt - but he sure likes his comfort! He does anything I want him to do, and I love him very much. He's my best friend.